It hardly needs repeating, but 2018 is the RAF's year. Celebrating its 100th birthday as the world's first independent air force, the date has historic implications not just for the UK, but globally. The Royal International Air Tattoo was chosen this year as the RAF's international celebration of this momentous occasion. For the Air Tattoo, this was the show that has been looked upon from afar for nearly half a decade, if not more. All eyes turned to the Cotswolds in mid-July to see if a success could be made of it. 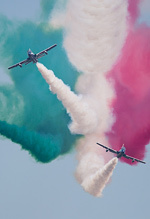 Tom Jones reports on the RAF's international celebration of its centenary at Fairford. Photography by the UKAR Staff Team. This show was the big one. The one that had been mumbled about for years. 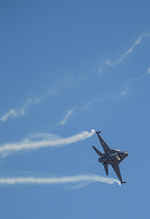 The entire fabric of the traditional RIAT two-day airshow weekend has been grown over four years to become, for the first time, a full on three-day airshow affair for this year's celebration. The mumbling grew louder as the 2018 date drew nearer, and began to reach a crescendo last autumn, when, staggeringly, the first sets of enclosures and ticket packages began to sell out. 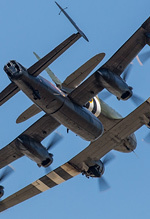 The early sell outs were understandable, especially from eager aviation enthusiasts looking ahead to their annual aviation extravaganza, rather than the family looking for a nice July event to attend with the kids. RIAT 2018 was touted as the international celebration of the Royal Air Force's centenary. The RAF, more than most of the world's other air forces, has great cause for international celebration. A great many air forces and similar units have significant links with the RAF; from the nations and former nations of the Commonwealth, to the Dutch, Polish, Czechs, and many others and their involvement in WWII, right through to the modern day where it has just been announced that the jointly-manned Qatari Air Force/RAF 12 Squadron has been stood up, the RAF's history is steeped with the contributions of other nations. The other reason for the early fever pitch of ticket sales was also, in part, due to the different way that the Air Tattoo approached this year. 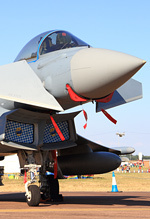 To unseasoned eyes, the differences might have been subtle, but they were plain to see to regular Air Tattoo visitors. Announcing an additional day's arrivals, stretching it to a Tuesday sowed seeds of anticipation. RIAT has not had three full arrivals and practice days for half a decade. True, Friday this year was an entire show day rather than the more relaxed morning arrivals/midday airshow that we have seen over the past couple of years, but nevertheless, building into the RIAT experience a full extra day started tongues wagging. There were a few flaws with the Tuesday arrivals, though. Not including the cost of the additional arrivals days in the standard Mach 3 FRIAT package left a bitter taste in the mouths of most enthusiasts. The old "see the first aircraft arrive and the last one depart" line seems to have been dropped from the webpage. It's not so much the price, it's that the inclusion of the extra day in the package would have been so easy to do. I doubt anyone would have objected if the FRIAT ticket price was increased to accommodate the extra day. The simple fact that it wasn't included felt like some form of unforced error. For a show that has always considered itself as more of an enthusiast's show than most others, the enthusiasts felt forgotten. RIAT is never just FRIAT, and should not be considered as such, but it's the wider implication that is important; it was an early PR stumble. It's been said before that airshows can live or die by their actions throughout the year, and with the odd (thankfully rare) year or two under their belt where they have admitted that they got things wrong, RIAT know this too. The additional arrivals day itself was, depending upon whom is asked, either pretty relaxed or pretty sedate. There were relatively few movements, and whilst I do not doubt that it gave the team some welcome breathing space, it felt like a day which, when first envisaged, expected more of itself. The other early announcement that got tongues wagging was that there would be a different flying programme on each day, due to the number of expected participants. Great for those with the financial means (which must be pretty considerable these days) to attend the whole three-day event, not so great for those who could only attend a single day. As an exception to an expanded event this year, or indeed if operational commitments stipulate, it can be tolerated, but DBH should avoid this formula as a regular feature, especially given that ticket prices remain the same for each day, and the announcement of what was flying each day came after the Saturday tickets were sold-out. If there is a particular item one wants to see, it turns an airshow weekend into a lottery. Another announcement that emerged through the course of the show's build-up was that the static display would be made much larger than in previous years, the logical conclusion of which being the anticipation of a much larger than normal volume of static items. The good news of this announcement, other than an increase in participation, was the re-use after a number of years' hiatus of the western loop static park. The tree-lined background allowed for some un-cluttered photographs of European F-16s, and the beautiful cronky old Estonian An-2. Sadly, the Su-27 parked next to it was not as well positioned, with the distracting detritus of the airfield as a background in the evening light. It seemed a puzzling placement, given the volume of space that surrounded the Colt. 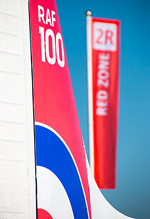 With these announcements of the extra day of arrivals, the diverse flying display, and the vast static park, on top of it being the RAF's official international celebration of its centenary, expectations were high. Unfairly so? Perhaps. It appears, on reflection, that RIAT did much to hype up expectations, but it also appears that enthusiasts, dreaming with rose tinted spectacles of the events of the late ‘90s probably raised expectations in their own minds, too. In some respects, these raised expectations were a battle that RIAT was never going to win, and it's unfair to say that the airshow did not live up to expectations when those expectations were longing thoughts of what would now be unachievable rows of C-130s and KC-135s. However, with the above announcements, it's clear that RIAT had raised expectations and are therefore not completely innocent, either. With all of this in mind, whether or not those expectations were fair or whether the organisers were stuck between a rock and a hard place is something that will probably be debated for a long time to come. The flying participation was quality, but not stellar. The outstanding Royal Canadian Air Force contingent should not be overlooked. It's been ten years since the RCAF's CF-18 demonstration has reached these shores, and wearing its striking NORAD anniversary scheme the Canadian participation really felt like a nation digging deep to support the RAF's 100th birthday. This extended to the static park, too. Last year the CC-177 and CH-147 were well-received and this year a CC-177, CH-146 resplendent in its own special scheme, and a CC-130 all graced the static park. What a shame that their CP-140 Aurora was unable to make the trip. The Ukrainians returned with their wonderfully brutish Su-27 display, and Couteau Delta once again wowed crowds with the power of their Dassault mounts. Repeating last year, the USAF B-2A Spirit made a single-day flypast, flying directly from its base in Missouri; it's amazing that RIAT crowds have been able to see the B-2A flying two years on the bounce, though the high and sedate single pass had its edge blunted by memories of the pair of low topside passes of last year. The truth of the flying display however, full of an interesting variety of participants though it was, was that there was very little that has not attended the airshow within the last five years. 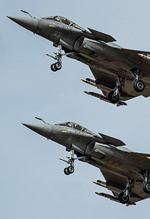 With the exception of the RCAF CF-18 and the French Navy Rafale M pairing, the flying display felt very much like it was another RIAT by the numbers. 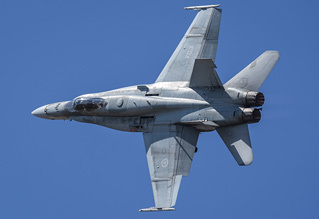 Additionally, for the first time in a great many years, Boeing's traditional biennial appearance with its F/A-18 display, often flown to great accolade, was broken and the US Navy fighter failed to appear in 2018. A shame, as it would have been interesting to compare the legacy F-18 displays on offer to the significantly upgraded model. It's true to say that the airshow was bludgeoned by a series of unfortunate cancellations. The Romanian MiG-21's flying display was understandably removed from the list after a tragic crash just before the show. Even more tantalising, the French Navy's highly anticipated ATL2 arrived at the show, performed what looked like a wonderful practice display, and then left on an operational tasking before the weekend. 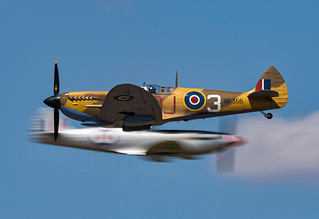 Perhaps with those items, the flying display might have felt a bit more extraordinary than usual, and it's likely that their loss was felt nowhere as keenly as in Douglas Bader House, but it's the show that is delivered that is reviewed, not what might have been. Likewise, the static park suffered its fair share of unfortunate cancellations; the Polish Su-22 did not make it, neither did the USAF B-52H, or indeed the Romanian C-27J. A static item that looked like it would join the cancellation list was the Australian Air Force E-7A Wedgetail. Rumours that it had suffered technical gremlins on its journey to RAF Fairford began to circulate the park and view enclosures, and its cancellation seemed certain as the gates opened on Friday with it nowhere to be seen. However, showing true spirit, the straggling machine finally managed to make it to the airshow, flying in on the Friday evening to take pride of place in the static park over the weekend. The spirit and dedication of the Aussie contingent should be celebrated, showing grit and determination to make it to the show even if a little later than planned. The E-7A was placed in a static park that was full of diamonds amongst the sea of welcome but regular participants. The aforementioned Canadians were accompanied by a RAF contingent that was not to be sniffed at; participation from most of the RAF's ISTAR fleet was welcome, as was the majority of RAF types on the ground. 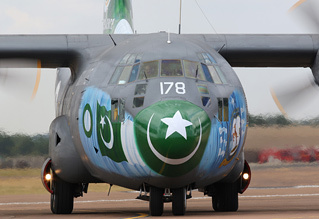 Also welcome was the return of the Pakistan Air Force C-130, resplendent in special markings that put the RAF100 corporate sticker to shame. A number of other participants stood out: it was excellent to see the US-based HC-130 and HH-60 from the US Air Force, the latter dismantled and brought to the UK for the airshow. Likewise, a very bedraggled-looking (a good thing, I hasten to add) B-1B once again graced the static display, and credit to its positioning which allowed about as clutter-free a background as one can get at RIAT's centre showground these days. The C-27Js of the Slovak and Lithuanian Air Forces were great to see, the former a debut, as were the Austrian Air Force and Polish Air Force's C-130s. Two medium-sized strategic airlifters, and gems in their own right, debuted at RIAT: Embraer sent their brand new (and currently only airworthy after the second model overran a runway in Brazil) KC-390, and from Japan the Kawasaki C-2 made its appearance as the first public arrival on Tuesday morning. Both bucking the trend of boring all-over grey paint, they added weight and a splash of colour to the static park. It was also a bittersweet moment for the Royal Air Force's Tornado fleet. Ever-present at RIAT since their entry into service, the pair of old and worn-out machines marked the final attendance of the type in RAF service at an Air Tattoo this year. In some respects, perhaps it's a shame more of a fuss was not made of the pair's final appearance in the static park. Of course, given the prominence the Air Tattoo has as part of the RAF100 celebrations, much was planned for the public over the weekend. 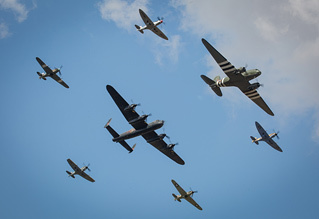 The primary event was to be the RAF flypast, a scaled-down version of the incredible 100 aircraft flypast over London earlier in the week, the 50 or so aircraft flypast over RAF Fairford was supposed to be one of the highlights of the year, not just the Air Tattoo weekend. Planned for the Friday show day only, and with the typical spitefulness that is British weather, the one patch of rough cloud and rain that the UK had seen for weeks placed itself right over Swindon with a tail over Fairford at the time the RAF flypast was forming up. The volume of aircraft in the airspace, and the sudden volatility of the weather meant that the flypast, touted as *the* thing to be remembered about this year's RIAT, was cancelled. There's a certain sad irony that the RAF managed its 90th birthday flypast at a year when the airshow was rained-off, and yet in one of the driest summers for years, with the rest of the week scorching, the one patch of bad weather put paid to the entire thing for the 100th. I can't join the berating of the RAF, RIAT, or anyone else involved in the cancellation of the flypast. Weather is, sadly, just that, and is damned by many in this industry. A great many have asked, with some legitimacy, why a contingency was not planned; a great many more questions were asked long before the cancellation as to why the flypast was only ever Friday only. I'm sure personnel, operational and budgetary commitments were all factors. I'm sure that they were reasonable in some ways. Though, unless I'm much mistaken, for the personnel involved to be a part of the unique celebration of the RAF's centenary, it would be worth a single weekend away. It's worth nothing that the London flypast was flown without contingency, as indeed was the 2008 flypast, and they all worked, and the RAF avoided that embarrassment. However, the RAF must accept that failing to plan to participate on at least one other day always left the risk for them to be bitten, and bitten they were. I don't apportion blame to anyone. That's not what this is about. However, just the same as the cancellation of the Romanian MiG-21, we judge a show by what materialises, not what might have been, and without the RAF100 flypast, which was hyped up prior to the show, the full RAF100 weekend celebrations fell flat. 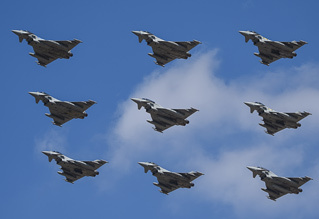 There were some saving graces, however; on Saturday and Sunday, the RAF's Typhoon force performed diamond nine formation flypasts over the airfield, and the RAF BBMF's Trenchard display was wonderfully flown, including no fewer than five of the fleet's fighters on the Saturday. It was, however, the 617 Squadron flypast that provided the most enjoyable RAF celebration to witness. The newly-arrived RAF F-35B made its airshow debut as a UK-based type, and flew in formation with the BBMF's Lancaster, and a Tornado GR4, marking the final flying participation at an Air Tattoo of the latter type in RAF hands. The wonderful past/present/future formation was simple, but effective. A rocketing pass by the RAF Tornado gave way to some hovering (how we've missed that party trick!) 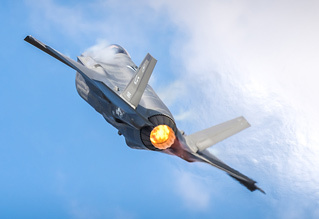 from the F-35. An excellent addition, kept simple, and all the more effective for it, it was one of the true highlights of the weekend. As a whole, the show felt like it was a great RIAT, but once again fell into the nearly-but-not-quite feel of most RAF efforts these days. The RAF100 celebrations felt like more of a footnote to a standard RIAT, rather than the main page. There lacked a feeling of passion, of drive, of commitment to a theatre of the air from the air arm. I'm not one who is naïve enough to wish for a full-fat RAF role demo of yesteryear, but at the same time, there was very little else to latch on to. The means for some interesting and unique tributes were there; the Royal Norwegian Air Force Historical Squadron were present and flew their display at RIAT and went to the effort of painting their Vampire pair into RAF colours, both IV Squadron and 72 Squadron. 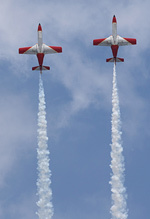 Both squadrons remain active, operating Hawks and Tucanos respectively. Was there really no way that RAF Valley and RAF Linton-on-Ouse could not spare a single machine each for a joint flypast with the historic types? Even if there wasn't, as Ben Dunnell noted, and the timetabling pointed to on the Saturday, the Vampire pair had historic links to the history of the Red Arrows, and the RAFAT followed the Vampire pair in the schedule on the weekend. Was there no scope to make something more of that opportunity? The USAF Heritage Flight provided a very good display and included a Spitfire to its pairing of Mustang and F-35, to note the links of the USAF and RAF. The F-35 itself provided a number of excellent flypasts (given the gaps between its repositioning, you'd struggle to call it a display) over the weekend, however, for the "international celebration of RAF100", other than the USAF Heritage Flight, there seemed precious little joint international/RAF celebrations in the air. By comparison, the RAF Cosford Airshow managed in the previous month to achieve a unique (and long overdue) 303 Squadron commemoration flypast with a Polish MiG-29 and Hawker Hurricane. Something that was received excellently at that show. We've even seen commemorations of the links between the RAF and other air forces at previous RIATs: in 2010 we bore witness to a multi-nation flypast commemorating Battle of Britain pilots, in 2014 we saw a number of display team mounts fly a formation to commemorate the anniversary of the Red Arrows, in 2015 we saw something as innocuous as the German, Italian, and RAF Tornado flypasts commemorating the TTTE, last year we saw the RAF Red Arrows fly with the USAF Thunderbirds, and so on. Was there nothing that the RAF and/or DBH could have done in the air at RIAT to commemorate its deep-rooted links with other air forces? Perhaps, again, we expect too much, but if we can see items like what was listed above at previous RIATs (and they are welcome) commemorating things that are nowhere near the level significance of this year, why, in 2018, was there precious little for the international celebration of the big one hundred? It's not just previous RIATs or other UK airshows, either. Looking back on other air arms' celebrations of their birthdays, the Swiss, the Turkish, the US Navy, the Russians and others all had something that was unmissable, something that would likely never be seen again and something that is remembered with fondness and talked about enthusiastically by those who were there. It's a colossally hard thing to deliver, for sure. It's easy for us to sit here and pick holes, and a lot harder to do, but this year's RIAT felt like it had none of the stuff that would make it stand out, nothing that would make us say "I was there". It's likely that this review, like almost anything else RIAT-related this year, will divide opinions. This is clear: the show was an excellent, excellent RIAT, perhaps even vintage. There is, though, a significant "but" attached to it; something was missing, and I'm hard pressed to say what that something was. What will we look back on in five, ten, twenty, fifty, or even one hundred years? Will this be a RIAT we all go misty-eyed for? Will it be an airshow for us to speak of with rose-tinted spectacles to the generations that follow us? I am not sure it will be, and the reason why is difficult to quantify. 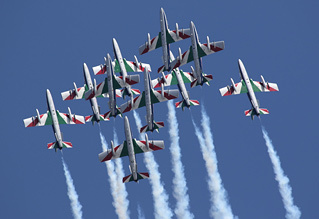 It might be something as simple as RIAT being victims of their own success; when we all look back and view this show in combination with all of the other successful RIATs we have had in recent years, there is little in it that will make it stand out. It might be yet another symptom of the apparent "that'll do" culture of the Royal Air Force at the moment, that the RAF has other things on its mind, and is happy to let the event pass without much fanfare. It might be something completely separate, or, indeed, it may simply be the manifestation of nearly a decade of politicians relentlessly hacking and slicing away at our armed forces. Or, because nothing is ever black and white, it may be a combination of all of these things, and more. Much like England's World Cup semi-final, it felt like a show of two halves. To me, this was an excellent RIAT and, as a standalone show, one to be proud of, but what about the "international celebration of RAF100"? I can't put it more concisely than the now-hallowed words of one of our own: Meh.